An addicting fighting game in which your objective is to help a little warrior get through the different levels. 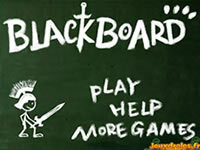 Defeat the enemies you’ll meet on the blackboard and gather as many golden coins as possible. These coins allow you to buy other weapons that will make you even more powerful in the next levels.